Hanoi is Vietnam’s capital city. It’s the political hub of the country, as well as the cultural and historical center. Founded more than 1,000 years ago, the city remains steeped in tradition. Hanoi was occupied by the Chinese for much of its early history, and later by the French. Both countries left a lasting cultural imprint. Centuries-old Buddhist temples are scattered throughout the city, often set alongside hundred-year-old French colonial mansions and an ever-increasing number of modern skyscrapers. It’s an eclectic mix of East and West, old and new. Numerous parks and lakes provide shade and tranquility to this otherwise bustling metropolis, as millions of motorbikes, cars, bicycles, buses, and pedestrians all compete for space on roads that weren’t originally designed for motorized traffic. Cyclos (three-wheeled pedicabs) sedately ferry wide-eyed tourists through the atmospheric warren of ancient streets. Entire neighborhoods are hidden in the interior of city blocks, accessed by narrow alleys designed only for two-wheeled vehicles and foot traffic. Beautiful Hoan Kiem Lake is the heart of central Hanoi. This peaceful oasis is surrounded by lovely shade trees and flowers, views of ancient temples, colonial mansions, and the ancient, bustling maze of little streets known as the Old Quarter. In the early morning hours, ladies practice tai-chi by the lake, as the men huddle together playing Chinese chess and gossiping. In the evenings the park comes alive with walkers, joggers, and snuggling lovers. On the weekends, the roads around the lake are closed to motorized traffic, and the entire area transforms into a pedestrian mall, with musicians, artists, happy families, and curious tourists taking over the busy streets. Wherever you live in Hanoi, you’ll find an eclectic, chaotic hodgepodge of activity that never seems to slow down. Bustling markets, bicycle vendors hawking their products, people whiling away the hours in outdoor beer halls and sidewalk cafés, and children playing in the streets as their mother’s chase after them with bowls of food—it’s all part of the unique Hanoi experience. Hanoi is a delightfully livable city due to its unique culture, proximity to many of Vietnam’s most impressive tourist attractions, and its low cost of living. There’s unique architecture, fascinating historical sites, and a vibrant, traditional city center. Its charming lakes, parks, and tree-lined boulevards are oases of calm in this burgeoning, bustling city. The hot summers, chilly winters, and near-perfect spring and fall weather are an added benefit. It isn’t hard to imagine the Hanoi of times past while walking in the warren of small streets and tiny alleyways that make up the Old Quarter. Tiny mom-and-pop shops and a never-ending procession of street vendors sell everything from fruits and vegetables to shoes, flowers, and brooms. Enterprising ladies set up portable kitchens and tiny plastic chairs along the sidewalks, treating diners to fresh, inexpensive meals, using family recipes that have been handed down for generations. Take a step back in time to Paris in the early 20th century while exploring the French Quarter. Grand French colonial mansions house government buildings, museums, embassies, upscale hotels, and gourmet restaurants. Century-old shade trees provide pleasant respite, near trendy bistros selling fresh pastries, cakes, and strong coffee. Hanoi makes a perfect base to explore many of Vietnam’s top attractions. Ba Vi National Park, Cuc Phuong National Park, the UNESCO World Heritage Site of Halong Bay, the exotic Perfume Pagoda, ancient handicraft villages, and the rivers, caves, and mountains of Ninh Binh Province are all easy daytrips from the city. Hanoi has one of the lowest costs of living of any major city in Southeast Asia. A bag of fresh local vegetables and tropical fruit won’t cost more than a couple of dollars at one of the many traditional markets, and supermarkets offer wide selections of local and imported goods at reasonable prices. There are at least two dozen specialty imported food stores in the city and an ever-expanding assortment of restaurants serving international fare—impressive for a city where you couldn’t find a hamburger at any price just 10 years ago. Buses transport those who don’t want to contend with the traffic, and the fare to practically anywhere in the city is less than 35 cents. Affordable metered taxis are everywhere. A couple can live a comfortable middle-class lifestyle in Hanoi on a budget of $1,000 per month or less. Hanoi is a favorite traveler’s destination due to its unique culture, its proximity to many of Vietnam’s most impressive tourist spots, and its low cost of living. There’s unique architecture, fascinating historical sites, and a vibrant, traditional city center. Its charming lakes, parks, and tree-lined boulevards are oases of calm in this burgeoning, bustling city. The hot summers, chilly winters, and near-perfect spring and fall weather are also attractive to many foreigners. Hanoi, Vietnam’s capital and the second largest city, celebrated its 1,000-year anniversary in 2010. 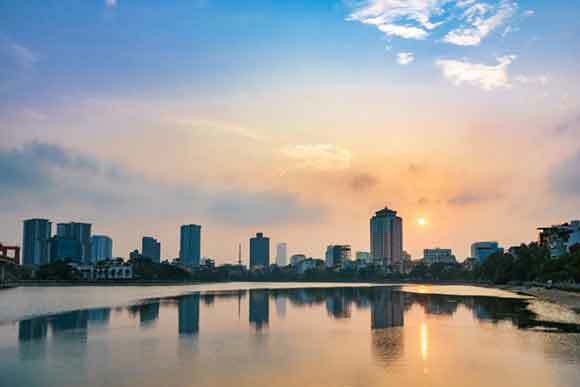 Hanoi has retained many of its ancient traditions, while offering all the modern amenities that expats desire. Step back in time to Paris in the early 20th century while exploring the French Quarter. Grand French colonial mansions house government buildings, museums, embassies, upscale hotels, and fancy restaurants. Numerous parks and shade trees provide pleasant respite, near trendy bistros selling fresh pastries, cakes, and strong coffee. Central to both the Old Quarter and the French Quarter is peaceful Hoan Kiem Lake, the spiritual heart of Hanoi. Many foreigners have chosen to live in this vibrant part of the city, which is within walking distance of many of Hanoi’s finest restaurants, an active nightlife scene, and many of the city’s top attractions. Tay Ho (West Lake) is the largest lake in Hanoi, and Tay Ho District is one of the most popular areas for expats. Restaurants in Tay Ho offer a wide variety of cuisines, ranging from American to Ukrainian, and everything in between. Many shops here sell imported foods and products. Tay Ho is a popular area for expat get-togethers, as only a few tourists venture into this part of the city. Tay Ho is the most expensive district in Hanoi. Many homes are on quiet streets with small yards, and families with children will be close to several well-regarded international schools. The better apartments offer spectacular views overlooking the lake and the city skyline. Retirees who want to live in luxury will often find themselves settling here, though it’s possible to find more affordable housing in this area, too. Ba Dinh District is not far from either West Lake or Hoan Kiem Lake, and is the home of many of Hanoi’s embassies and administrative buildings. Some of Hanoi’s most elegant mansions are located here. Ba Dinh is convenient to both Hoan Kiem and Tay Ho, yet it has a local feel. Foreigners who like the idea of integrating into Vietnamese culture will enjoy living in this part of the city. There are several large, modern supermarkets, department stores, and malls located in Hanoi. The traditional markets, where fruit, produce, and meat are sold, often offer fresher and less expensive fare than what is found in the supermarkets. Hanoi’s JCI accredited Vinmec International Hospital offers comprehensive medical services at reasonable prices. A visit to an English-speaking specialist costs about $30. Several other international hospitals and clinics provide good care to foreigners, though they are often more costly. 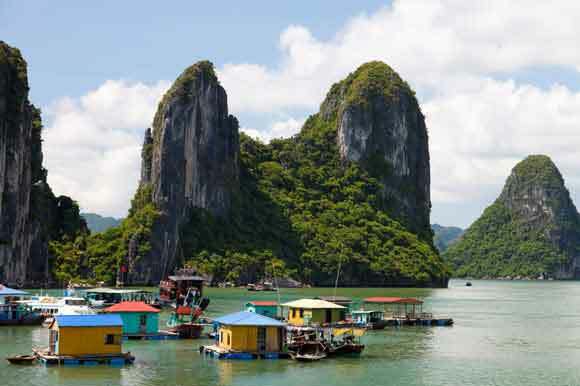 Many of Vietnam’s top attractions are located within a few hours of Hanoi, including nearby Ba Vi National Park, Cuc Phuong National Park, the UNESCO World Heritage Site of Halong Bay, the exotic Perfume Pagoda, and the rivers, caves, and mountains in Ninh Binh Province.